When Russia discovers a technology that renders people immune to all known forms of weaponry, they undertake a military campaign to expand their holdings throughout Asia. With an immunity to guns, missiles, and CBRN attacks, those who oppose the Russians are forced to resort to hand-to-hand combat! Roided up super soldiers clash with martial arts masters with the fate the world hanging in the balance! From Yasushi Baba comes the bizarre, over the top, political parody, fight manga about international relations filtered through the lens of professional wrestling, Golosseum, Vol. 1! This was one of the more bizarre reads I’ve come across in recent memory, and I’m not sure what I can say about it that won’t ruin the impact of encountering Golosseum, Vol. 1 in the wild for the first time. Within the first twenty pages it becomes clear just what kind of series this is, as readers are treated to sequences of a young girl breaking the necks of suit clad spies, and a vacationing couple being brutally gunned down, complete with entrance and exit wounds. Those who stick around will be treated to more grotesqueries, ranging from more ultraviolet deaths and action scenes, to Baba’s rendering of ludicrously over the top hyper-muscled and masculine super soldiers. At this point the parodies and satirical elements of the series feel little more than surface level, though there could be something interesting read into Baba’s decision to make the most dangerous characters in this volume, not the muscular military men, but the young girl instead. It’s certainly difficult to see her dropping Russian super soldiers on their heads with a Burning Hammer—a wrestling move innovated by the legendary Kenta Kobashi—and not feel like Baba is trying to say something about the nature of masculinity and femininity. Likewise, the scene in which Axe Bowgun, a Hulk Hogan stand-in, literally clotheslines the head off of rioting, black, gang members is difficult not to read into. On one level, it just seems like a silly mash up of American cultural references, but then you realize he was deployed by the U.S. government at the behest of its president, Billary Quintone. Suddenly the sequence recalls both the real Hulkster’s unfortunate use of racial epitaphs from a few years ago, and Clinton’s unfortunate comments about super predators in our inner cities, and you’re forced to reconsider that knee-jerk dismissal. 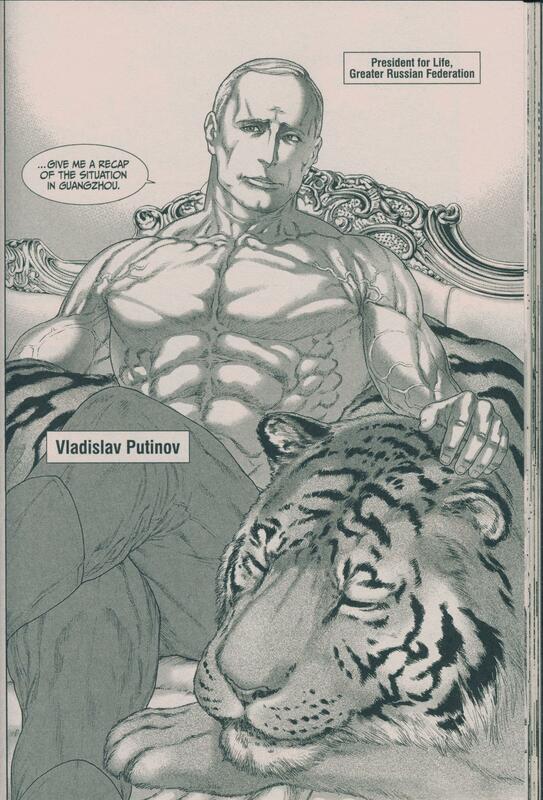 On the other hand, like Putinov and his tiger, maybe these scenes present simply because they look absolutely ridiculous and excessive, like everything else in Golosseum, Vol. 1. It’s that kind of series. While I usually don’t talk much about covers, I’d be remiss if I didn’t mention the cover for Golosseum, Vol. 1. It’s a wonderful mash up of part movie poster, part wrestling poster, topped off with a color scheme that brings to mind pulpy movie posters of yesteryear. The front cover features Putinov karate chopping a tiger’s head off, alongside images of several other stars and memorable moments. This motif continues to the back cover, complete with movie poster’s credit roll and running time. It’s a really fantastic cover which helps sets the tone for the book’s mixture of ultra violence, pro-wrestling, and low budget, 60s-70s movie weirdness. While I’m not entirely sure where Baba is taking the story, it’s hard to deny that Golosseum, Vol. 1 is one hell of a compelling spectacle that left me wanting to see more. The mixture of over the top violence and parody results in a series which perfectly embodies the WWE’s old tagline, “Anything can happen…!” more so than anything I’ve read or seen in recent memory. While Baba’s artwork, with it’s overly muscled bodies, and the strong focus of physical violence might be a turn off to some folks, this absolutely should find an audience in the U.S. In fact, if you found yourself lining up to catch the midnight showing of Deadpool 2 this past week, then this the series might just be for you. It’s hilarious, ridiculous, and very, very fun! Golosseum, Vol. 1 will be available on 5/22 from Kodansha Comics. Review copy provided by the publisher.